Hidalgo County Justice of the Peace Jaime "Jerry" Muñoz looks on as Justice of the Peace Bobby Contreras hands out caseload figures to members of a grievance committee Friday morning. Both judges requested a $10,000 raise. EDINBURG — A six-member committee denied a $10,000 salary increase for two justices of the peace Friday morning, but the pair might still receive a $5,000 raise and an additional $5,000 car allowance. 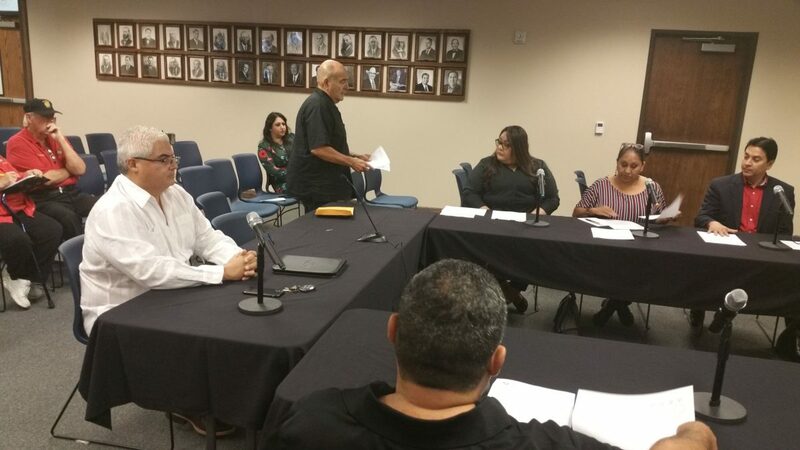 Precinct 2 JPs Bobby Contreras and Jaime “Jerry” Muñoz requested an additional $15,000 in compensation for the upcoming fiscal year beginning in January. On Tuesday they asked county commissioners for an additional $5,000 annual car allowance, which is currently set at $10,000, and on Friday asked a grievance committee for a $10,000 raise. As JPs for the most urbanized precinct, they are often called out at all hours of the day and night for work — whether it’s to pronounce people dead, arraign suspects or section mental health patients. Both argued they respond to a majority of those calls compared to their counterparts in other precincts — some of which do not respond to those types of calls at all. On Tuesday, when the pair first approached commissioners during a budget workshop, the county officials agreed to increase their car stipend and directed staff to include an additional $5,000 for them in the proposed budget. The car allowance for the other seven JPs would remain at $10,000, they said. The directives are still subject to final approval. But on Friday, when the pair asked the grievance committee for a $10,000 raise, they were met with more resistance. The six-member group was comprised of three members of the public, including Cruz Lopez and Belinda Sifuentes, and three elected officials: Hidalgo County Tax Assessor-Collector Paul Villarreal, Hidalgo County Sheriff Eddie Guerra and Hidalgo County Clerk Arturo Guajardo Jr.
Hidalgo County Judge Ramon Garcia presided over the committee, but could not cast a vote. “This year we have voted to give every employee a 3 percent raise, and these two individuals feel that they should be getting, instead of a 3-percent increase, that they should get a 15-percent increase,” Garcia said, introducing the subject. The salaries for all JPs are currently set at $82,400 plus a $10,000 car allowance for a total of $92,400. The 3-percent cost of living adjustment would equate to an additional $2,427 for each judge across the board. Muñoz leads the county in the number of inquests, calls for mental health and magistrations. Contreras comes in second for inquests and magistrations. In 2016, when the county approved a 3 percent raise for all employees and elected officials, Muñoz declined to receive his, while Contreras opted for it. The disparity, however, did not last long. The following year, commissioners raised Muñoz’s salary to meet the rest of his counterparts. Garcia put the issue up for a vote after a few questions from Sifuentes and Lopez, which were about their roles and accountability, and a few comments from members of the audience — most of which from the watchdog group Objective Watchers of the Legal System, or OWLS. He asked the six members to raise their hands if they believed the two judges deserved a $10,000 increase. After a few seconds, Guajardo asked if he could make a motion to award the pair a $5,000 raise instead, and budget officer Sergio Cruz said he could. At that point, the group once again voted. This time, Sifuentes and all elected officials voted in favor, while Lopez and the other member of the public, voted against. The 4-to-2 vote, however, was not enough to mandate commissioners to give the pair the raise, nor does it count as a recommendation. Garcia, however, said he would notify the commissioners court about the vote and will have the final say over the matter. “I feel comfortable in telling you that the majority will be considered by the court very favorably,” he said. County officials must approve and pass a budget before Oct. 1.